The George Cross (GC) is the highest civil decoration of the United Kingdom, and also holds, or has held, that status in many of the other countries of the Commonwealth of Nations. moremoreThe GC is the civilian counterpart of the Victoria Cross (VC) and the highest gallantry award for civilians as well as for military personnel in actions which are not in the face of the enemy or for which purely military honours would not normally be granted. The GC was instituted on 24 September 1940 by King George VI. At this time, during the height of The Blitz, there was a strong desire to reward the many acts of civilian courage. The existing awards open to civilians were not judged suitable to meet the new situation, therefore it was decided that the George Cross and the George Medal would be instituted to recognise both civilian gallantry in the face of enemy action and brave deeds more generally. Announcing the new award, the King said: “In order that they should be worthily and promptly recognised, I have decided to create, at once, a new mark of honour for men and women in all walks of civilian life. I propose to give my name to this new distinction, which will consist of the George Cross, which will rank next to the Victoria Cross, and the George Medal for wider distribution. The Warrant for the GC (along with that of the GM), dated 24 January 1941, was published in the London Gazette on 31 January 1941. The GC was intended to replace the Empire Gallantry Medal (EGM); all holders of the EGM were instructed to exchange their medals for a GC, a substitution of awards unprecedented in the history of British decorations. 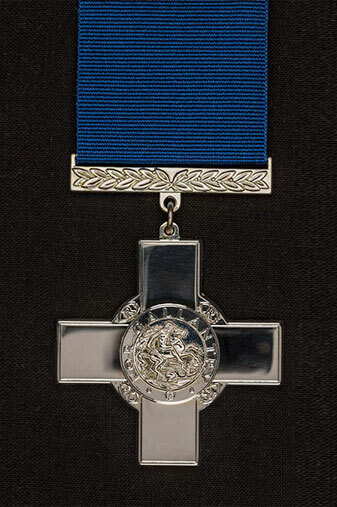 This substitution policy ignored holders of the Albert Medal (AM) and the Edward Medal (EM), awards which both took precedence over the EGM.The anomaly was only rectified in 1971, when the surviving recipients of the AM and the EM were invited to exchange their award for the George Cross. Of the 64 holders of the Albert Medal and 68 holders of the Edward Medal eligible to exchange, 49 and 59 respectively took up the option. Posted in the London Gazette on the 5th May 1944.Awarded for work at Salerno. Lt J.G. Allen spent a week in Salerno; he defuzed and removed seven British bombs with long delay fuses and anti handling devices. These bombs were causing problems for military operations as they were next to the Salerno- Naples road and railway. They could not be destroyed in situ or be allowed to explode due to the damage to routes of supply it would cause. The normal mode of operation for this type of bomb would have been to destroy in situ.The week previous to these actions Lt Allen and a section of 17 Bomb Disposal Company, cleared two Barracks of booby traps after 25 American soldiers were killed. The George Medal (GM) is the second level civil decoration of the United Kingdom and Commonwealth. The GM was instituted on 24 September 1940 by King George VI At this time, during the height of The Blitz there was a strong desire to reward the many acts of civilian courage. The existing awards open to civilians were not judged suitable to meet the new situation, therefore it was decided that the George Cross and the George Medal would be instituted to recognise both civilian gallantry in the face of enemy action and brave deeds more generally. The Warrant for the GM (along with that of the GC), dated 24 January 1941, was published in the London Gazetteon 3 January 1941. 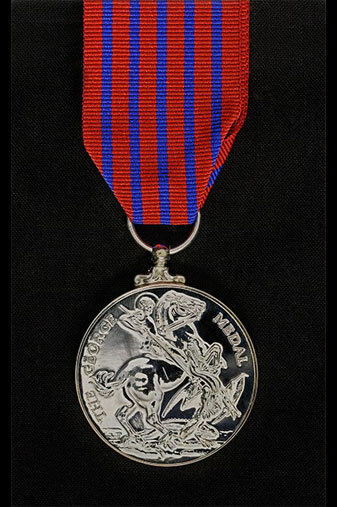 The medal is granted in recognition of “acts of great bravery.” The GM was originally not issued posthumously, however the warrant was amended in 1977 to allow posthumous awards, several of which have been subsequently made. Bars are awarded to the GM in recognition of the performance of further acts of bravery meriting the award. In undress uniform or on occasions when the medal ribbon alone is worn, a silver rosette is worn on the ribbon to indicate each bar. Recipients are entitled to the postnominal letters GM. 2009340 Sgt Arthur James Ashmore. GM 3 Bomb Disposal Company. Posted in the London Gazette on the 19th November 1943. Awarded for work at Grimsby. Sgt Ashmore was one of seven people awarded the George Medal for work between the 13/14th June 1943, whilst clearing SD2’s (Butterfly Bombs).He dealt with one SD2 which was located under a railway wagon, the cargo of which was valuable. This SD2 was sandbagged in such a way that when detonated the blast caused no damage to wagon and goods. Using the same method he disposed of another SD2 close to a signal box, without putting it out of action.Ten day’s later; a SD2 was located over a false ceiling, hanging by its drogues. To get to this device he had to rig tackle from the chimneystack to pull it clear. It in fact jammed and Sgt Ashmore had to climb back on the roof to free it. On climbing down and pulling it, the SD2 exploded. 123013 Capt Alexander George Bainbridge. GM. Posted in the London Gazette on the 30th September 1941. Awarded for work in London.Monk Street, Woolwich, Southern Outfall Sewer, September 1940and High Street, Plumstead, October 1940.More details to be added when available.2nd Lt James Barnes.No 4 Bomb Disposal Company.Posted in the London Gazette on the 22 January 1941.Awarded for work at the Vauxhall Motor Factory, Luton.2nd Lt Barnes was called to the Vauxhall Motor Factory at Luton, on the 6th November 1940. The factory had been hit by ten bombs during the preceding night. Damage was superficial; however two bombs had failed to detonate. One of these bombs was located next to a furnace in the continuous heat treatment plant. This plant was vital to production. If this bomb had exploded production would have ceased for at least ten days. Due to the importance of the department Barnes immediately dealt with and removed the bomb.The raid had only happened two and a half hours before Barnes arrived. The A.R.P control centre had been damaged by two bombs, the second of which lay close by. Any further damage to this centre would result in 9,000 workers being laid off. Barnes with no hesitation excavated the bomb and removed the fuze, therefore preventing it exploding and causing further damage.Lt Barnes was awarded the GM for his heroism, it was his cool and courageous action that saved the company from losing production, important to the war effort. The factory was back in production by the next morning.Lt P.A. Bays.Posted in the London Gazette on the 19th October 1945.Awarded for work in the United Kingdom.Further details to follow when available. 2126849 Sgt William Henry Bailey. GM. Posted in the London Gazette on the 10th March 1944. Awarded for work in Plymouth.Sgt Bailey assisted Lt Grey, (also awarded the GM), on removing a 500kg bomb dropped on the night of 11/12 August 1943. This bomb landed tail first on the corner of Efford Road, Plymouth. This road was the main route from Plymouth to Exeter, this bomb effectively sealed of Plymouth from the East, as all other routes were closed due to bomb craters or other unexploded bombs.The bomb was partially uncovered and on investigation the fuze was found to be a ticking number 17. As it was partially uncovered the decision was made and passed down that an attempt to remove it was to be made. The task was made even more daunting by the fact that another bomb from this stick had exploded at 06:00 that same morning. Also the bomb had partly demolished a building and the remains were overhanging it, in fact this was roughly a one hundred weight piece of concrete, only held by a couple of pieces of metal reinforcement. Due to the fragile nature of the concrete shoring was not possible so work commenced with the possibility of it becoming detached and falling on those below working on the bomb.Finally there was another danger added to the equation, three feet away was a fractured gas main.The task took four hours, with Sgt Bailey working in shifts with Lt Gray, as the effects of the gas was felt upon them. Between them they cleared debris to get to the fuse, the bomb being unsecure threatened to move at any time. The 50 fuze was immunized, the bomb loaded onto a truck, with the 17 fuse still ticking and taken to a bomb dump where it exploded some hours later. 2968034 Cpl William Owen Bean. GM. Posted in the London Gazette on the 17th December 1940. Awarded for work at Middelton, Lancashire.Based in Manchester, on the 31st August 1941 he and his section were called to a railway embankment at Middelton, Lancashire. Where several bombs had landed, eight had failed to detonate and were close to a highly populated area.Digging began, however the ground was found to be hard going.Bean, by his leadership, quick thinking and coolness were an example to his men and he kept his section going and all eight bombs were recovered, allowing several hundred people to return to their homes.This award of the George Medal to a Junior Non Commissioned Officer was one of very few. 56967 Capt Alfred John Biggs. GM. Posted in the London Gazette on the 22 January 1941. Awarded for work at Curzon Street, Bordesley, Birmingham.On the 1st November, at 01:30 in the morning a 250kg bomb fell through the railway viaduct at Curzon Street. Capt Biggs of 9 BD Company was informed 15 minutes later. He went to investigate this report with his Sgt; they found the bomb had partially buried itself under the viaduct. If this bomb exploded the damage it caused would have caused serious disruption to rail traffic for a considerable time.Capt Biggs set to uncovering the fuse straight away, which was ticking. On attempting to remove the fuse it was found to be jammed. Therefore Briggs removed the base plate with a hammer and cold chisel and removed the explosive with a hosepipe and crowbar. The explosive fill was removed by 02:30, seven minutes before the fuse detonated.For his coolness and bravery Capt Briggs was awarded the George Medal. 210258 Lt Thomas Blackshaw. GM. Posted in the London Gazette on the 17th August 1943. Awarded for work at sites in Mountnessing, Essex.On the night of 3/4th March 1943, 346 S.D.2’s, (Butterfly Bombs) were dropped on Essex. These were fitted with two fuses a No 70 B, anti handling, designed to detonate at the slightest vibration or touch, the other a No 67, designed to explode any time up to half an hour. Due to bad manufacturing the fuzes frequently stopped, shortly before it exploded. Therefore the Bomb Disposal personnel were left with an anti handling device to deal with. To make matters worse if one exploded it could cause a sympathetic detonation of others within a 25 yards radius.Disposal was completed by using one of two methods, either by attaching a cord to the device and pulling it from a safe distance or by placing a guncotton charge on it, both methods needed steady hands and nerve with a gentle touch. On the day of this raid Lt Blackshaw disposed of 31 S.D2’s all of which were armed with anti handling devices. For a further 48 hours, Blackshaw dealt with other S.D.2’s accounting for another 64 in this period. For sustained courage, in dealing with a total of 95 S.D.2’s in such a short period of time, where each device was of a significant risk he was awarded the George Medal.Lt T.W.T. Blackwell. MBE.No 127 and 128 Bomb Disposal Sections.Posted in the London Gazette on the 6th November 1942.Lt Blackwell prior to taking over, Bomb Disposal in Malta in October 1941 on the death of Lt Talbot, had been awarded a MBE.Several delayed action bombs were dropped on the night of 30th July 1941. One fell in a populated area, burying civilians.Blackwell investigated and found it was fused by two No 17 fuzes, these were delayed action and were ticking. Due to civilians being buried it was decided to remove the bomb allowing rescue work to continue. The problem was no lifting gear and a bomb weighing 550lbs. The course of action tow, it away. Debris was removed with the assistance of PC Baylis; the bomb hitched up with a twelve foot rope and moved initially this failed, as debris got in the way. PC Baylis therefore drove and Blackwell cleared a route. The bomb was successfully removed to a safe place, during this time another of the bombs exploded. Sadly no buried civilians survived.Blackwell received the George Medal for this and other operations on Malta, for his untiring efforts and heroism throughout the worst of the Malta bombing. Posted in the London Gazette on the 28th December 1945. Awarded for work at Dunbar.Whilst working on a mine field to the south of Dunbar, on the 27th April 1945, Lt Dunbar was called upon to attend a minefield to the north of the town, were an accident had occurred. On arriving at the incident Borthwick found that two mines had detonated and 3 Prisoners of War were died and nine others wounded and all were still in the minefield. Borthwick and Sgt H. Craik cleared a route enabling the wounded and dead men to be recovered. There were problems of communication due to the language barrier during these operations and the tendency of the wounded to move around as stretcher parties came near. Lt Borthwick was awarded the George Medal for “Operating, at great personnel risk, in a situation fraught with difficulties and by his own initiative and gallant act, ensured that the wounded men were recovered with greatest possible speed and sent to hospital”Prior to this incident Brothwick had spent a year clearing up to 1,600 mines.Sgt Craik was awarded the BEM for his part in the operation.Later that year Brothwick was tasked to a similar incident at Peffer Sands Minefield. 154267 Temporary Capt Edward Louis Bourne. GM. Placed in the London Gazette on the 23rd December 1943. 1990980 Sgt John Brabin. GM. Placed in the London Gazette on the 15th September 1943. Placed in the London Gazette on the 9th July 1946. Awarded for minefield work at Dunbar.On the 14th September 1945 an accident happened in a minefield near Dunbar. The officer and three men were killed, Briggs recovered their bodies. The moral of the remaining men was badly shaken and the minefield was re-fenced. Work on the field was made more hazardous by rock formations affecting the locating equipment.On the 27 September, Briggs brought the survivors back to the minefield and alone in view of his men located and disarmed several mines. This restored the men’s confidence and work re-started on clearance operations. No further incidents occurred.Lt Briggs was awarded the George Medal for his unfaltering courage and devotion to duty in setting a fine example to his men. Placed in the London Gazette on the 17th February 1942. Awarded for work at Gas works Romford and A13 road Rainham, Essex.Cpl Bristow assisted Lt J.P Walton on the 5th November 1940 in dealing with two 250kg bombs armed with both no 17 and 50 fuzes. These were in gasholders at the Romford Gas Works. The air conditions were so bad that work had to be stopped every twenty minutes. This work was completed in the shortest possible time, ensuring minimum damage and services to be re-started with the least disruption. Also this work was carried out whilst the air raid continued.Also on the 26th to 28th February 1941, Bristow assisted Walton in dealing with three remaining 250kg bombs of a stick of four straddling the A13 at Rainham, Essex. One of this stick exploded after 18 hours. Work commenced on these bombs after a safety period of four days, they were fuzed with both No 17 and 50 fuzes. Two when uncovered were found to be ticking, but immunized successfully. Placed in the London Gazette on the 15th March 1946.Awarded for work in the U.K.
2067513 Sgt Charles Morris Cann. GM. Posted in the London Gazette on the 22nd January 1941. Awarded for work at Ipswich, Suffolk on the 28th October 1940.Sgt Cann was the first Non Commissioned Officer to defuze live bombs also he was one of the pioneers in BD work.He under took work on parachute mines regardless of whether they had been defuzed by the Royal Navy. Whilst he was dealing with a mine in a back garden, the fuze commenced ticking. This had 17 seconds to run before exploding, therefore Cann ran for it, rumor has it that a tubby Cann managed to clear 6 garden walls before it went of, these walls were 6 feet tall, no mean feat. On the 28th October 1940, Cann was tasked with investigating a new fuze type on a small anti personnel bomb. Numerous of these had been dropped in the Ipswich area. He managed to secure a complete bomb, the mechanism was a hairbreadths from triggering the device. This was dismantled and rendered safe. Previous to this a number of policemen had been injured fatally by these devices. Due to the recovery of this device, precautionary measures were implemented, saving lives. In 1945 Cann now commissioned Captain, was involved in providing BD Operatives with safe methods of clearing beach mines laid in shingle. This was done and units working on the beaches were issued High Pressure Water Jetting Equipment.Sadly Cann died in 1945, not as a result of BD work but whilst having his tonsils removed, tragically his son died in 1946 whilst having the same operation. 1880745 Spr John William Carter. GM. Posted in the London Gazette on the 11th March 1941. Awarded for work in Gravesend, Kent in continual support of Lt C.H. Green.In Gravesend, Sapper Green supported his officer on several incidents these included two 250kg bombs in a school playing field, a Flam 250 incendiary at Bowater Paper Mills, close to the River Thames and another bomb in a back garden in Dashwood Road. This last bomb was discovered with its fuze visible but so badly damaged as to be unidentifiable. Later it was found to be a no 17 Long Delay fuze, which was removed by hammer and cold chisel, standard practice at the time, the fuze fired ten minutes after removal. 2006164 Spr Stanley Chesher. GM. Placed in the London Gazette on the 17th December 1940. His Citation reads:The conduct of Sapper Chesher, under conditions of extraordinary difficulty and danger, has been especially meritorious. He has never allowed considerations for his personal safety to interfere with his work and no situation, however perilous, has been able to affect his nerve. He has shown himself to be as ready to face hard work as he is to meet risk and it has been found more difficult to persuade him to come out of a bomb hole than to get him to enter one. On 18 August 1940 he worked for 9 hours, stripped and up to his waist in water, in order to reach a large High Explosive delayed-action bomb which had fallen in a pond. Placed in the London Gazette on the 28th October 1941. Awarded for three incidents:Harold Wood, Essex, August 1940.Railway Station, Hornchurch, Essex, September 1940. Warley near Brentwood, Essex, October 1940.Further details to be added when found. Lt Michael .A. Clinton. GM & Bar. George Medal. Awarded for work in Romford, Essex.Placed in the London Gazette on the 17th February 1942.1. Based in Colchester, Clinton was tasked with immunizing and removing a 250kg bomb in Romford. This was fuzed with a no 17, the fuze pocket was damaged and the fuze could not be removed. The bomb had to be moved as disposal in situ was not acceptable. Whilst being lifted the fuze became active and ticking was heard, thankfully it stopped. But for how long was uncertain. After the bomb was lowered onto a truck, Clinton himself drove it away, to a area where it would cause no damage, this was completed before it exploded.2. On the 14th March 1941, Clinton located and uncovered a 250kg bomb. This had two fuzes, a normal 50 but a new version 17A, delayed action. This was possibly the first of these new fuzes to be discovered. Clinton took the decision to remove it for research. Due to the position of the bomb the fuze was underneath the bomb. Disregarding all safety precautions Clinton, removed by fuzes by hand in torchlight. Major General Taylor, commented on Clinton’s actions, stating that he had accepted the risk of certain death, with sustained courage and complete disregard to personal safety. At this time a Stethoscope could be used to hear if the fuze was ticking, but there was no equipment to stop the clock. Also there could have been a booby trap under the 17A fuze to stop it falling into enemy hands for research.For both these incident Lt M.A. Clinton was awarded the George Medal.Bar to GM. Awarded for work in Essex.Placed in the London Gazette on the 17th August 1943.Due to a raid at Sisted on the 6th March 1943 Clinton was dispatched and found 21 S.D.2’s (Butterfly Bombs). Some were buried 8 to 10 inches into the ground others were found on the surface. All were fitted with the type 70 (B) fuzes, anti handling. The surface bombs were detonated by having a piece of string attached and being pulled. Those buried had the earth around them cleared till explosive could be put in contact with them, then detonated.On the 7th March 1943, Clinton then disposed of 8 more West Thurrock and at Thames Haven oil refinery 10 more. These were fitted with the No 67 fuze, which was a clock work delay set for up to 30 minutes. Three of these at Thames Haven had to be moved as they had come to rest under oil pipes. For these incidents Clinton received his second George Medal. Only two officers were given this honor. Platoon Officer Reg .E. Cooke. GM. MBE. Home Guard.Auxiliary Bomb Disposal Unit. Placed in the London Gazette on the 11 March 1941. Awarded for work in a factory at Birmingham.Cooke’s citation reads:Platoon Officer R.E. Cooke, of the Home Guard, went to deal with a 250kg bomb which fell on the factory in which he worked on 28th October 1940. When it was reached it was found to be ticking. The bomb had now been there for forty eight hours and from experience, it was known that the bomb could explode at any time. An attempt was made to remove the fuze, but it failed and he withdrew to consider the problem. In view of the importance of the factory it was decided to attack the fuze for the second time. This time he took a crow bar with him. In the end, it needed three people to extract the ticking fuze. This time they were partially successful, but only in pulling the fuze part way out of the bomb. It was then decided to flood the shaft and hope the water would stop the fuze. Apparently it did and the bomb was later safely removed.2nd LT R.H. Lee was also awarded the George Medal for this incident.Note: It is not well known that many large factories had their own BD units. These were there in case the regular BD units were unavailable. These units were called Auxiliary BD Units and were part of the Home Guard. they however, wore RE cap badges and the treasured bomb badge on their sleeves. There training was from the local Regular BD Officers. There are numerous mentions of these units digging up and immunizing bombs in their factories. Sgt J. Cooke. GM. BEM. Gilbert and Ellice Islands.October 1965 to May 1966. Major Qualtrough and Sgt J. Cooke BEM, were tasked with a most hazardous overseas task. Initially on there way to Betio Island, they were to carry out a reconnaissance on Penang, of abandoned Japanese mine and bomb dumps. Part of Penang had been cleared in the 1950’s, however nine storage tunnels and hidden pits were discovered and contained a vast collection of mines and shells, many oozing explosives. Work went on in Penang till November 1965, when both men set of for Betio.The majority of explosives on Betio were found to be in fifty collapsed bunkers. Qualtrough and Cooke’s official task was to, clear the bunkers by hand and sea dump the contents, re-inter any body parts found and finally give the island a clearance sweep using mine detectors, a doubting task. A preliminary reconnaissance was undertaken on the 30th November 1965, forty two bunkers were located, some gun sites, others command posts and bomb stores. The collapsed bunkers contained shells for 203, 152, 157 and 76.2 mm caliber, also present were mines bombs and other ammunition. Work commenced on the 3rd December, locals were employed for the task alongside fifteen prisoners provided by the Chief Police Officer. By 19th January 1966 al bar one bunker was clear. The ammunition removed was in poor condition, some so badly deteriorated that it gave of toxic fumes. The local work force however was uninterested in safety often removing the explosive at night for private use. The final bunker was the most difficult, as it had suffered several direct hits through the war. Excavation began on 29th December 1965 but on 3rd February work ceased as the risks were too great, 20.3 tons had by now been removed. Sea dumping continued till 3 March 1966. In total over 100 tons of explosives were cleared from Betio, however much more remained. Both Major Qualtrough and Sgt Cooke were later awarded the George Medal. Awarded for an incident at Weybridge.At Weybridge Hawker Aircraft Factory, on the 21st September 1940, at 10:30 in the morning three bombs were dropped, two exploded with causing slight damage, the third penetrated the roof passed through a wall and came to a halt on a concrete driveway, outside the assembling shed. If this bomb had exploded it would have caused damage both to building and aircraft that was irreparable.The 1st Canadian Pioneer Battalion stationed nearby, were asked for assistance, Lt Patten later followed by Cunnington looked at the bomb and towed it away to a safer area, where little damage could be caused if it exploded. It exploded later in the morning.Lt Patten was awarded the George Cross and Capt Cunningham the George Medal for showing complete disregard for his personal safety. 127300 Lt Charles Ernest Davies. GM. Posted in the London Gazette on the 28th October 1941. Awarded for incidents at:1. Hawker Aircraft Factory, Weybridge, Surrey, 21st September 19402. Onslow Village, Guilford, Surrey, 27th October 1940.3. Ormonde Road, Guilford, Surrey, 28th October 1940.4. Airspeed Factory, Muddiford Lane, Christchurch, Hampshire, 10th May 1941.1. Lt Davies, joined Bomb Disposal in August 1940 and was stationed at Winchester. In the first twelve months of BD work he dealt with four hundred bombs. Thirty Five of these had been categorized as Cat A, i.e. immediate disposal essential, bomb must not explode in situ, under any circumstance.One of these Cat A’s was at the Hawker Aircraft factory, Weybridge. Two 50 kg’s had been dropped at 10:30 in the morning. The first one that Davies dealt with was found when he arrived at 14:00 had not penetrated the concrete floor of the factory, this he moved to a crater in a nearby field. The second had penetrated the floor and had to be dug out. This operation took al night, at 08:00 hours the next day the bomb was reached. Both bombs were fitted with a No 17 long delay fuze. Whilst digging for the second bomb the first detonated. Due to the bravery of Davies and his men, working when they knew there was a strong possibility that they could be blown up at any time, 25 aircraft vital to the war were saved.2. On the 27th October 1940 Davies was tasked with investigating a UXB at Onslow, near Guilford. The UXB was under a sewer and cables also pipes, carrying al the main services, in the rear garden of a private house. It was found to be a 250kg bomb, fitted with a no 17 fuze. The fuze pocket was damaged making the removal of the fuze impossible. So it was placed on a truck and driven to a safe area to be disposed of.3. The next day 28th October 1940 saw Davies dealing with a 250kg bomb, armed with both a No 17 and 50 fuze. It had landed in the hallway of a house, mid terrace, and penetrated 16 feet then offset 12 feet i.e. it was under one of the houses. This was dealt with For these incidents and a further one at an 4. Airspeed Factory in Hampshire, May 1941, Davies was awarded the George Medal. 166507 Capt John Ernest Arthur Deacon. GM. Placed in the London Gazette on the 25th January 1946. Incident at Automatic telephone exchange, Belfast.On the 25th October 1945, Capt Deacon was tasked to a bomb found at the automatic telephone exchange. This exchange serviced the Stormont building which housed the Northern Ireland Parliament and two other government buildings. The bomb was fuzed by both a No 50 and 17 fuzes. The 50 was immunized the 17 was stopped by using a magnetic clock stopper, so the bomb could be moved away from the building, as there was a risk of the 17 fuze detonating if it was removed. In transit the clock stopper was dislodged and was damaged. Therefore the rest of the journey was carried out with no means of stopping the 17 fuze. The outcome was, the bomb arrived without detonating at a safe area and was disposed of, with no damage to property or personnel. Due to the speed that the operation was carried out, a large number of people who had been evacuated from their homes, returned before nightfall. Both Lt Deacon and Sgt Alfred Parker who assisted were awarded the George Medal. 87982 Lt Thomas James Deane. GM. Posted in the London Gazette on the 17th February 1942. Awarded for work at Romford Essex, August 1940.Great Braddow Essex, January 1941.Railway Gas Works 15th May 41 and Petrol Depot Aug 41 both at Saxmundham Essex.Lt T.J. Deane based at Colchester and with six or seven months BD service, resulting in around one hundred bombs being dealt with by him. was called to Great Baddow, in Jan 41. This call resulted with the locating of two 1000kg bombs being located. These were steamed out using high pressure steam. During this process there was a small explosion and the fuze extension cap blew off. Deane continued with the steaming operation. The extension cap on 1000kg bombs exploding was to be a continuing problem.In May 1941, was called to a incident at Saxmundham. On arrival four bombs were found, these were of the 250kg variety, which had fallen that evening. These were located in the Railway Yard, Gas Works and Petrol Depot. All four were classified as type A, i.e. under no circumstance was explosion in situ permissible. Work on all four started immediately. Instead of the normally expected 17 and 50 fuzes, these were found to be fuzed with the 25 Impact type. All were dealt with successfully. Posted in the London Gazette on the 21st October 1941. Awarded for two actions: Laing’s Shipyard Sunderland County Durham, 12/13 August 1940Sheffield Yorkshire 13/16 December 1940. No further details available at this time. Posted in the London Gazette on the 22nd June 1941. Awarded for an incident within the Shoeburyness Garrison Essex, 18 August 1940.Lt Dickinson was based with his section at Bury Saint Edmund, his citation sums up the bravery of all those serving in Bomb Disposal in the early days.His citation reads:”Lieut Kenneth Dickinson has been engaged upon Bomb Disposal duties since June 1940. On the 18th August an unexploded bomb fell within the confines of Shoeburyness Garrison. He immediately went to the spot and with the assistance of A Sgt and a Spr, despite the fact that there was a severe air raid on at the time they uncovered the bomb, placed it in a lorry and drove the dangerous cargo to a safer spot where he finally defuzed it and rendered it safe.”The whole operation was carried out under constant air raid conditions. Awarded for work at Sicilian Avenue Holburn London. 10th December 1940.On the night of 9th September 1940, a bomb landed in Sicilian Avenue, Holburn. Capt Dixon inspected it early morning of the 10th. The bomb had only just penetrated the pavement, was partly broken and laying near the surface. This bomb was causing serious problems with the traffic. Dixon decided to take immediate action regardless of the considerable risk, as the bomb was fitted with a No 17 fuze, which was ticking.Due to the distorted bomb casing there was no chance of stopping the clock, therefore the explosive fill was removed whilst the fuze ticked on. The operation was a success. This was one of over a hundred bombs that Dixon dealt with, including four category A’s.Dixon had been awarded the Military Cross prior to joining Bomb Disposal. Lt William Anderson Feather GM, BSC. 119063 Lt William Anderson Feather GM, BSC. Awarded for incidents at:Royal Naval Mine Depot Wrabness Essex, 21/23 August 1940.Explosives and Chemical Products Works Harwich Essex, 9/15 September 1940.West Raynham Airfield Norfolk, 28 October 1940.Massingham Airfield Norfolk, 29 October 1940.Bury Saint Edmunds Suffolk 17 July 1941.On the 2nd October 1940 a bomb landed in the Royal Ordnance Factory, this was given a A1 category. Work started immediately, the soil was of blue clay composition, difficult to dig and timber, this problem continued through out the war. This bomb took fifty one days to reach and immunise after digging three shafts, it was at thirty four feet depth and off to one side at a distance of 16 feet.Lt Butch Feather was a BD Officer from the begining, with 4 BD Company, based at Bury St Edmunds. Although at the time he was at Hornchurch working under very heavy raid conditions.21st August 1940, Butch Feather went to eleven UXB’s reported to be 50kg’s just outside the Royal Navy Mine Depot. Loaded sea mines were stored here. Even though these mines were within close proximity to the working area, Feathers supervised his digging teams for two days, on five bombs presenting the greatest risk to the mines. One was found to be fuzed with a long delay, this fuze was removed before it detonated.On the night of the 9/10 September, Feather went to ten category A bombs. These were in the works of the Explosives and Chemical Products Company, Harwich. On investigation three 500kg bombs and seven 50kg bombs were located. Within fifty yards of most of these bombs was a gunpowder storage area, containg one ton of gunpowder. With his men he worked for days whilst under constant air attack, andit was only due to his tenacity and leadership, that the task was completed. All bombs immunised and work in the factory started in the minuim time possible.On October the 28th Feather was called to the RAF base at West Raynham, near Kings Lynn, where thirty five unexploded 50kg bombs were located. They had only just penetrated the ground. Feathers team worked quickly to uncover them and he removed the no 17 fuzes that they were armed with. He at the time had no knowledge of no 17 fuzes being fitted into the 50kg bomb. Due to their speed the airfield was back in operation on the same day.The next day saw him at Massingham, dealing with two 250kg and one 50kg bomb. These were made safe by the fuzes being removed within three hours of landing , this was a great risk as the 250 kg bombs often were fitted with a booby trapped 17 fuze. Maj George Raymond Fletcher, GM, MBE. 377837 Maj George Raymond Fletcher, GM, MBE. Posted in the London Gazette on the 21st April 1970. Awarded for a incident on at building site at Burghely Road, Camden, London, on the 1/2 October 1968.No further details at this time. Posted in the London Gazette on the 11th March 1941.Awarded for a incident at Bexley Mental Institution, Kent on the 18th October 1940.A large bomb had fallen into the Boiler House at the Bexley mental Institution. Lt Ford was tasked for the job. The bomb was located in the flue, the temperature was in excess of 100 degrees Fand the area was polluted with gas, making conditions difficult to work in. Ford however, displaying great courage and fortitude managed to render the bomb safe and arranged for its removal. 133006 Capt Samuel Garside. GM. Awarded for incidents at: The river at McNeils Wharf, Barking Essex , 24 September 1940.High Road, Twickenham, Middlesex, 1941.Garside is credited with one of the fastest and safest disposals recorede. He with his Sgt went to investigate a reported UXB, on arrival they found a clear pathway that the bomb had made through the ground, (called a trace).The bomb was a 500kg this was determined by the size of the entry hole, approximetly 24 inches. Garside probed the hole until he reached the tail fins. As they were in reach he tied a rope to them, betwen him and his Sgt they were able to pull the tail fins from the ground. When these were removed it left a clear shaft, using a long pole Garside pushed an explosive charge down onto the bomb, which they then detonated exploding the bomb below. Site cleared without having to get a shovel out.For this and other incidents he recieved the George Medal. Lt George. M. Gaylor GM. Posted in the London Gazette on the 20th April 1945. Awarded for an incident at Hassault, France in the Albert Canal, on the 6th November 1944.Work on rebuilding a destroyed bridge onthe Albert Canal was halted on the 6th November, as a UXB was discovered 30feet under the water. Lt Gaylor, went into the canal in a diving suit. He located the bomb, half buried in mud a under torn rail lines, steel girders and general wreckage. To get to the UXB he had to squeeze between the girders putting his suit at risk of ripping and his air line fouling. His life line was also at risk of catching thus trapping him.He worked under nil visibility conditions, however with the aid of a torch he managed to identify the fuze. No existing immunisation equipment could work under water, so he removed the fuze live. Due to visibility he was unable to be 100% sure that there was no second fuze. A rope was attached and the bomb lifted to the surface, where it was found to only have a single fuze. Construction work was now able to continue. 131777 Lt Lewis Gerhold GM AND Bar. Posted in the London Gazette on the 30th September 1941, GM and17 August 1943 and Bar.Awarded for incidents at;Royal Ordnance Factory, Bishopton Renfrewshire 4 Oct to 24 Nov 1940.High Level Rothsay Docks Isle of Bute 14 March to 3 April 1941.Tannockside Colliery Lanarkshire 9 to 12 May 1941.Essex 1943.Lt Gerhold was a lucky officer, when he recced a bpmb at a house in Bilbowie Road, Clydebank. It landed at 01.30 on the 14 March 1940, recced on the 15 March at 10.00 and detonated three hours later, before work commenced on it. On the 7th May similiar luch held for Gerhold a bomb fell in the grounds of 49 Polworth Gardens it exploded at 10.10 before Gerhold arrived to do his recce.May 7th saw Gerhold and his men at Tannochside Colliery, where work had ceased due to a UXB. This task took five days of digging to reach the bomb, it was fitted with a 17 and 50 fuze. The 17 was Stopped and the 50 immunised. Then steam sterilized all completed by 12.00 on the 12th.Another task was dealing with a bomb dropped on the night 13/14 March1941 at NO 2 high Level Docks Rothsay. This bomb had penetrated to a depth of twenty two feet, when uncovered it was found to be fitted both with a 17 and 17A fuze. Tidal conditions affected water levels in the shaft throughout the operation. Due to working conditions this bomb was not rendered safe till the 3rd April.For these and many others Gerhold received the George Medal and Bar. nstituted in 1914, the Military Cross (MC) was issued for gallantry in presence of the enemy to warrant and junior officers of the Army who were ineligible (on account of their rank) for the Distinguished Service Order. During the First World War, it was also available to equivalent ranks in the Royal Naval Division and Royal Marines and it later became available to equivalent ranks in the RAF for acts of gallantry on land. 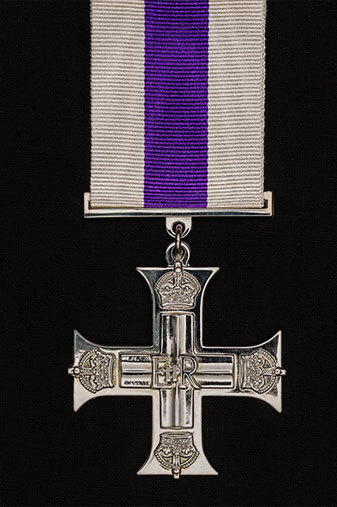 Instituted in 1914, the Military Cross (MC) was issued for gallantry in presence of the enemy to warrant and junior officers of the Army who were ineligible (on account of their rank) for the Distinguished Service Order. During the First World War, it was also available to equivalent ranks in the Royal Naval Division and Royal Marines and it later became available to equivalent ranks in the RAF for acts of gallantry on land. The equivalent award for the other ranks for gallantry on land in presence of the enemy was the Military Medal (MM) which had been instituted in 1916 and, similarly to the MC, later became available to RAF other ranks serving on the ground. Following the 1993 review, the MM was discontinued and the MC became available to all ranks of all services for exemplary gallantry on land in presence of the enemy. It is at a level below the Conspicuous Gallantry Cross and is at the equivalent level to the Distinguished Service Cross (for exemplary gallantry at sea) and the Distinguished Flying Cross (for exemplary gallantry in the air).